As evidenced by Homer Simpson, beer is best enjoyed while watching TV. Myself being an avid consumer of serial television, it seems logical that the two would work together nicely. That’s why I’m starting Sips & Spoilers in an effort to challenge my growing taste for craft beer as well my choice in television consumption. Beer is often paired with food, but have you ever tried pairing it with your favorite show? I’ll attempt to do so each week as I tackle current shows, Netflix releases, old favorites and whatever else seems to come my way. I’m also challenging myself to try new brews with every post. Don’t agree with my tastes on beer or TV? Let’s chat. Give me your best pairing. I’m not claiming to have all the answers; I’m just trying to have fun and educate myself. So, without further ado, let us be off into the great unknown. Anyone who has read my blog knows about my affinity for “Sleepy Hollow.” Its premise is absurd, its history is completely inaccurate and it’s way more fun than anything else on TV right now. The second season premiered three weeks ago and, as expected, it’s better and more ridiculous than ever before. Pumpkin beer is a hot commodity this time of year, and Schlafly does it better than anyone, at least according to Paste. It’s also brewed in St. Louis, my hometown, so of course it’ll be good, right? The “Sleepy Hollow” mythos paired with pumpkin ale probably seems a little gimmicky; and you wouldn’t be wrong in thinking so. But then again, the show itself is incredibly gimmicky. How else would you describe a show combining the legend of the headless horseman, revolutionary war “history” and biblical prophecy? Conceptual level: check. Schlafly’s Pumpkin Ale is a rich beer in flavor and color, echoing the make of Fox’s “Sleepy Hollow.” The show is impeccably crafted, from the writing to the cinematography. But the real pleasure of “Sleepy Hollow”, as echoed by all critics, is the chemistry between the show’s two leads, Tom Mison and Nicole Beharie. Some would argue that there’s a quiet sexual tension between the two, but I disagree. One of my favorite aspects of the show is the writers’ refusal to force romance where it isn’t necessary. The temptation is there, but why mess with a good thing? In the same way, Schlafly doesn’t overdo the pumpkin in this seasonal ale. Pumpkin beer in general has a tendency to lean too heavily on the pumpkin and not enough on the beer. 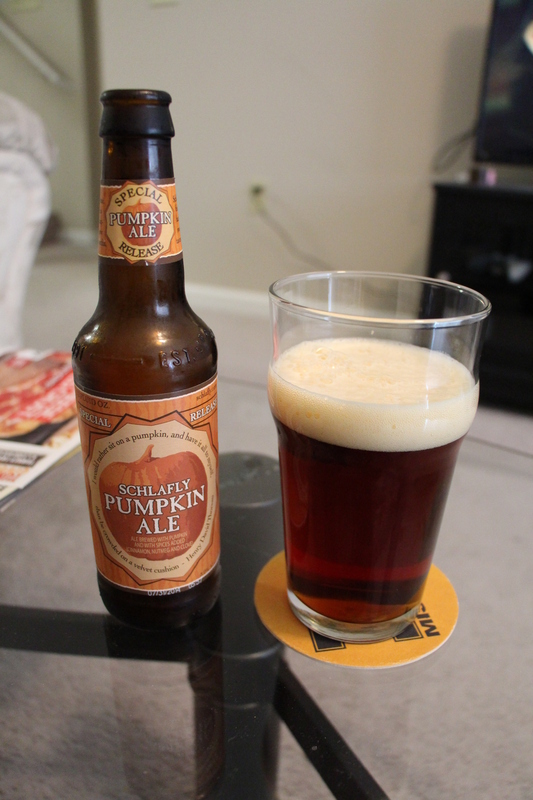 Schlafly’s has a strong, spicy pumpkin finish, but never at the expense of the ale flavor. It would be easy to capitalize on the pumpkin spice madness of autumn, but Schlafly shows restraint. That’s what makes this beer tasty. So if you haven’t already, grab a glass and pour yourself a draft of Schlafly Pumpkin. And remember to watch “Sleepy Hollow” on Monday’s at 8. Join me next week as I attempt to pair another brew with a popular Netflix comedy.